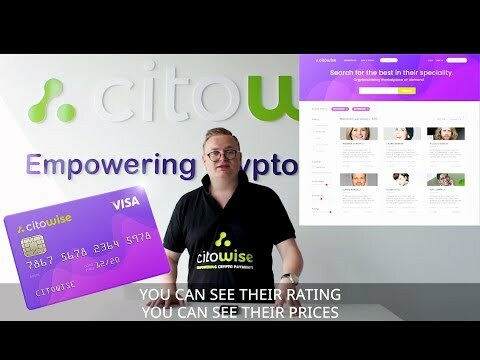 Citowise already provides cryptocommunity with reliable and professional cryptocurrency wallet, fighting back scammers and hackers, adopting cryptocurrencies for mass use and assuring a high quality of ICO projects. Citowise is now launching an initiative for business globalization. Buying a company in a remote jurisdiction and finding a professional assistance to run it remotely will be available at the tip of a finger. This will reside costs of maintaining business overseas and will save time for globalization oriented entrepreneurs. Citowise’s the best known product is its mobile wallet. The Citowise wallet is a multi-cryptocurrency wallet for private and business customers which empowers users to access mainstream adoption and use of cryptocurrencies globally. Citowise is one of the few wallets that is both safe and decentralized as it does not keep private user keys. This positions the Citowise wallet as a means of accessing and transacting on the blockchain. Citowise provides tools for corporate and private users to interact with blockchain networks. For private users, Citowise provides a safe, simple and reliable cryptocurrency mobile application. For business customers, Citowise offers a crypto payment processing gateway and company administrative and operating services including corporate registration of a company in foreign jurisdictions. For crypto startups, Citowise provides a unique ICO placement platform, and, a broad range of related consulting services for legal, marketing and technical solutions. The mobile crypto wallet is Citowise’s most popular product. It is a multi-cryptocurrency wallet for private and business customers which solves a lot of the problems that slows down the mainstream adoption and global use of cryptocurrencies, it is arguably and is recognized as such by the industry, the most complete, versatile and safest wallet around. For individuals,Citowise provides a simple and reliable cryptocurrency mobile application. For businesses, Citowise offers a crypto payment processing gateway and corporate services, including company registration in a large number of foreign jurisdictions, both within the EU and abroad. For crypto startups, we provide a unique state of the art ICO platform in a regulated safe legal EU jurisdiction coupled with a broad scope of consulting services ranging from legal, marketing and technical aspects. Citowise’s the best known product is its mobile wallet. The Citowise wallet is a multi-cryptocurrency wallet for private and business customers which empowers users to access mainstream adoption and use of cryptocurrencies globally. Citowise is one of the few wallets that is both safe and decentralized as it does not keep private user keys. This positions the Citowise wallet as a means of accessing and transacting on the blockchain. Citowise’s live wallet functionalities are second to none and haven’t yet been matched by any competitor in its peer group. Payment gateway - For companies, we provide a payment platform that accepts payments in coins and tokens. Integration into existing websites takes 5 minutes. Any ICO can start accepting its own tokens. Users are able to pay in project-specific tokens from their wallet within 3 clicks. The Citowise wallet has a proven track record, it has been live since 2017. Many of the functionalities above are fully functioning and the Citowise tech team is constantly integrating new upgrades and features.